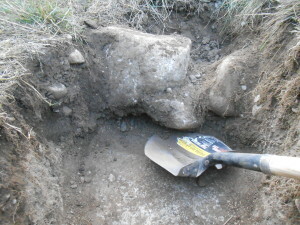 This is a chore I’ve put off for quite a while but finally broke down today and started digging up the septic. Unbelievably it’s already been five years since we moved onto our property. The as-built drawings from the county show a rough circle with the word “Septic?” in the general area where the septic is located. Past inspections filed with the county revealed information about the tank and the type of system, but didn’t give clear details about the exact location. Judging based on where the pipes leave the house, and where there was a depression that I thought was where it had to be, I started digging. Around 20″ down I hit the tank. From that point I widened the hole. It was tough digging. The dirt is full of rocks but I really couldn’t believe it when I found very large rocks placed right on top of the manhole cover. 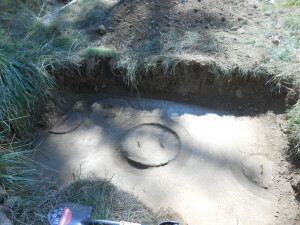 Given that you’d have to dig up the tank to pump it or inspect it, making the job harder by dropping big rocks into the hole hardly made sense. The ground was rocky enough already with plenty of good sized rocks! I removed the rocks and kept working, eventually uncovering the first cover. Then I consulted with my Dad about probably locations of the other covers. With his advice and help the work went faster and we uncovered the whole tank. After a lot of work, the tank was uncovered! I’ve scheduled the pumping and so that’ll be another task done once they get out and pump it. The rocks are going to be used for decorative edging different places on the property — but won’t be going back in the hole! It’ll get filled with dirt that is easier to dig, without the rocks. I’ll probably just fill it and plant new grass on the top. I’ve measured the whole tank, the distance from the house and all of that, so next time it’ll be a lot easier to locate and deal with the whole thing.